These are so yummy... Buttery rich cake. Creamy caramel and chocolate. A winning combination! This quick, easy and delightful recipe is inspired by Cookies and Cups. If you haven't visited the site, you should go check it out. Bring napkins, because I promise you'll be drooling! I know we've talked before about how certain types of candy are safe and some are not safe for a gluten free diet. Fortunately, Rolos are safe. And they do wondrous, magical things when you melt them in an oven. And they play well with others. Preheat oven to 350. Grease/spray a 9x13 baking ban. In a mixer, beat cake mix, Bisquick, evaporated milk and butter until well combined. Mixture should be thick and somewhat sticky. Divide batter in half, and press one half into your baking pan. Be sure that it's nice and even so it bakes properly. Bake about 8 minutes, or just til set. Keep an eye on it, or it will get crispy in a hurry. 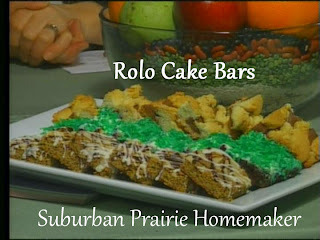 Remove from oven, and place Rolos on your cookie base, caramel side down. To make sure mine were distributed evenly, I started by putting 12 on, the way I do cookies on a cookie sheet. Then, I started filling in the spaces. Drop remaining batter over top of the Rolos. I did it by picking up little clumps and breaking them off by hand. If you are squeamish about this, you can use a couple of spoons. Bake for another 15-20 minutes, or til top just begins to brown. Like all gluten free baking, you need to be sure to let these cool completely before cutting and serving. Thinking about going gluten free and this is a great treat recipe. Thanks so much for sharing! Found you on the Positively Splendid Saturday Link Party! I always try to limit my gluten in my diet. This recipe sounds really good, and I love bars of any kind. So easy to take and eat. Thanks for sharing your creative inspiration at Sunday's Best. PS- following you on Facebook.